Package Included: 1 set Chair Covers (1×Chair Back Cover+1×Seat Cushion Cover） Note: Chairs not included. Approximate Measurements: Backrest width: 36-50cm Backrest height: 36-50cm Cushion width: 38-52cm Cushion Length: 38-52cm About Chairs Covers: 1. To save your office chairs from pet damage 2. Redecorate your chairs,changed the look of your desk set.Give your old chair a whole new look. Siez: Universal design chair covers. Backrest width & height 14"-20"(36-50cm), Cushion width & Length 15"-21"(38-52cm). 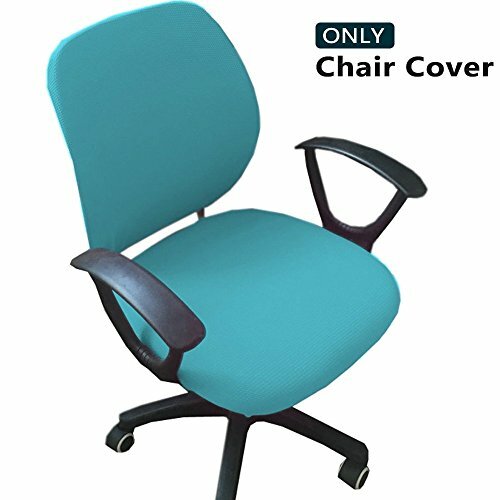 Best Chair Protector: Soft & comfortable fabric protects your new seat from spills and stains,does not slip or slide around, removable and reusable. Cover the tear, rips, and tattered edges of your plain old chairs. Elastic edge holds cover securely in place. Easy to Set Up: All you have to do is slip it gently over the seat. The elastic edge will keep it steady and nicely tucked in. Machine washable: You can as easily remove it and clean it by simply throwing it in the washing machine too. As simple as that! Please Note: Chair style differences: First, please examine the chair you need covers for to determine which style it is. Since designed to be foldable, folding chairs have a slanted back, while banquet chairs have a straightened back. After determining what style you need, then review the measurements stated of chair cover to determine if it will work. If you have any questions about this product by Melaluxe, contact us by completing and submitting the form below. If you are looking for a specif part number, please include it with your message.